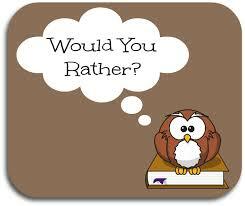 Book Tag would you rather? I have no objections to reading trilogies but I would rather read stand alones as I have read more of these. Female authors as some of my favorite books are by female authors. 3. Shop at Waterstones or Amazon? I tag all Book bloggers reading this – please tweet me on twitter if you do this tag as I would love to see your answers. Ooh I like this one – going to bookmark it and do it myself when I get a chance!